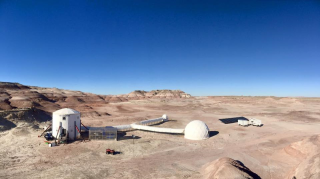 The Mars Society's Mars Desert Research Station in Utah was home to the first half of the society's Mars 160 mission, an 80-day mission to simulate a Red Planet trip. Mars Society crewmembers simulating a Martian mission starred in a unique 360-degree video yesterday (Dec. 13) as they emerged from the habitat where they spent 80 days. National Geographic, which just released a miniseries about Martian exploration, posted the video on its Facebook page. The group has just finished its mission at the Mars Desert Research Station in Utah, which is run by the nonprofit Mars Society. In the summer of 2017, the same core group will spend another 80 days at the society's research outpost in the Canadian Arctic. Coverage of the 160-day mission is ongoing here at Space.com. The segment was hosted by Cara Santa Maria and included commentary from experts such as science popularizer Neil deGrasse Tyson, Stephen Petranek (editor of Breakthrough Technology Alert) and John Grunsfeld, a former NASA astronaut who recently retired from the agency after serving as associate administrator of NASA's science mission directorate. Mars 160 crewmember Annalea Beattie has been delivering updates on the mission to Space.com. In late November, she sent a picture of the crew to her family, at which point her daughter compared it to the movie "The Shining" because of the isolation. Beattie said that it was a happy experience, but acknowledged that people still have much to learn about living on Mars. "Where small communities are locked inside together with little visual, tactile and auditory input from the physical world, always in constant threat to life from the harsh environment, devoid of fresh air and natural light and in long, monotonous periods of confined microgravity, a bit like these very long sentences I am writing to you, yep, I can see why you might think that things could get a little crazy," she wrote in an update that was posted Dec. 2. Editor's Note: To follow The Mars Society's Mars 160 mission's 2017 increment and see more photos and updates, visit the mission's website here: http://mars160.marssociety.org/. You can also follow the mission on Twitter @MDRSUpdates. For information on joining The Mars Society, visit: http://www.marssociety.org/home/join_us/.